Green Cloud in Pupil • Bearded Dragon . org . Today while holding my dragon, I noticed a greenish yellow cloudiness in his right pupil. His eating habits have not changed, he still hunts with excitement, and his winter slow down has been quite normal. I don't typically stare intently at his eyes and since his behavior was fine, I didn't think to do a careful inspection, so I have no idea how long his eye has been like this. It's not a film over the eye, it's in/behind the pupil. It seems similar to cataract but those seem to usually be a more cloudy blue with undefined edges and this spot is pretty defined and more of a greenish/yellow color. He has a vet appointment tonight, but I thought I would post to get some opinions. His habitat is a 4x2x2 with an Arcadia 12% mounted inside with a normal fluorescent UVA bulb for added light. Heat lamp is a 50 watt Halogen and gets his basking spot about 98-105. I also have a CHE running 24/7 next to his basking light to give more ambient heat as the house gets chilly. He also gets outside time a few days a week for about 30 mins in the sun. Substrate is tile, main diet is various greens 4x a week and dubia 2x a week. I dust calcium on the dubia for one feeding and multi vitamins on the next dubia feeding. Insects are gut loaded with Repashy Superload. I'm not sure what that is. 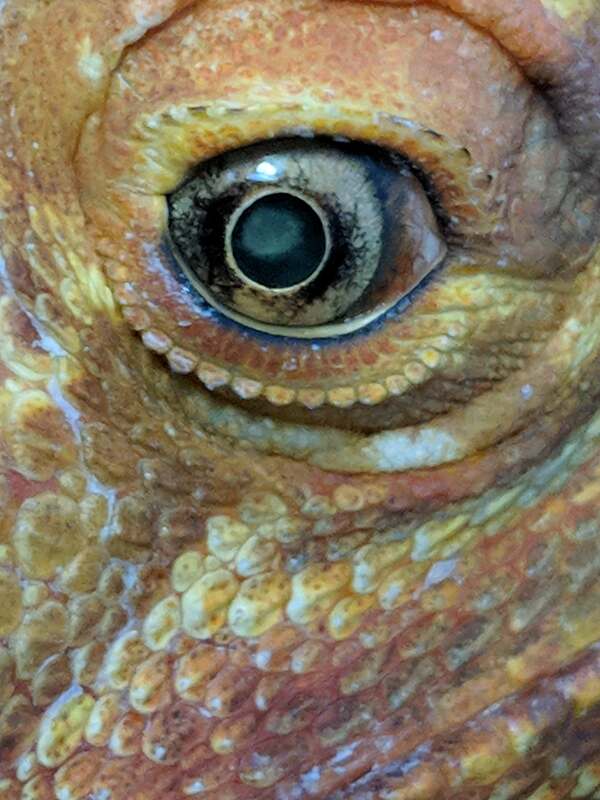 I just checked my dragon's eye and it is dark black throughout the center. It's good that he is still hunting well and appears to be able to see OK. I don't have enough info to know if that is harmful or not though. I'd be interested to hear what your vet thinks of it. Wow I have no idea what that is.. could he be possibly be going blind in that eye? 🤔 Please keep us posted. Varalidaine wrote: He's only 3! Cataracts ? …. so long as they are not covering the pupil …. not an issue but may be indicative of a vitamin deficiency. I just spoke with my Optometrist and showed him the photo. He said it looks like reflection off of a mass. Since it is happening in only one eye and appeared recently then it is likely a trauma related cataract. This is just an educated guess though. He told me that cataracts tend to happen in both eyes at the same time unless they are trauma related. He sees similar issues in humans when they get hit in the eye by a racquetball for example. CooperDragon wrote: I just spoke with my Optometrist and showed him the photo. He said it looks like reflection off of a mass. Since it is happening in only one eye and appeared recently then it is likely a trauma related cataract. This is just an educated guess though. He told me that cataracts tend to happen in both eyes at the same time unless they are trauma related. He sees similar issues in humans when they get hit in the eye by a racquetball for example. 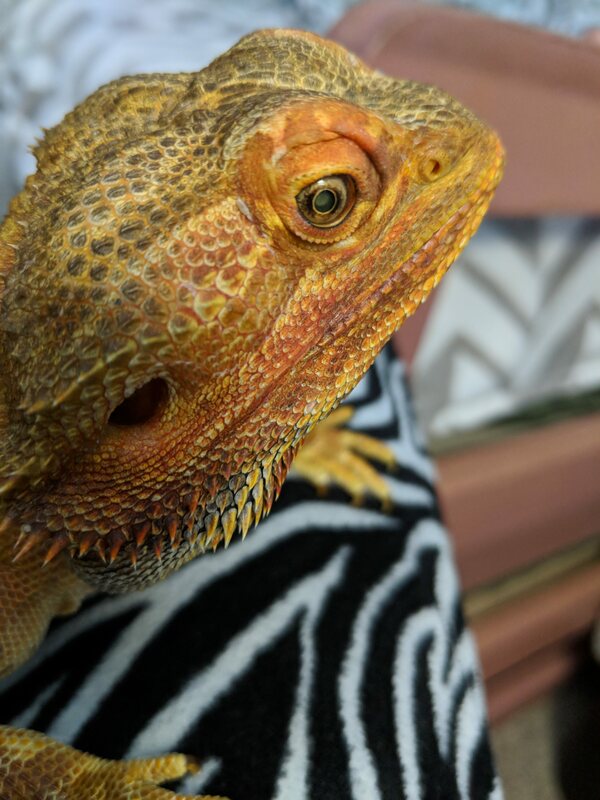 I recently noticed my dragons one eye looks the same as your photo. Have you noticed any improvements or is the trauma related cataract something that is permanent?